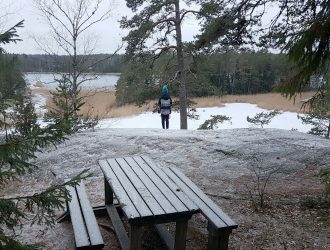 We stepped onto the well-covered hiking trail just next to Itäväylä (road 170) in Vuosaari. There was no sign on the main road to indicate that there is anything worth seeing in the forests next to the road, which seems amazing, considering how exciting the area actually is. 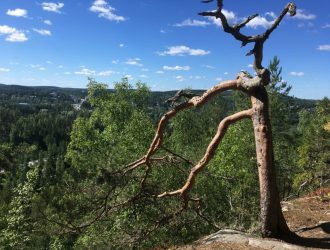 About 20m from the small parking place next to a bridge under Itäväylä, there is an unmarked path that leads into the forests. We had been advised to follow that road because it would lead to other sights around the Mustavuori area. The path was slightly slippery after a misty night but nonetheless, the leaf-covered path was easy to see and follow. The path widened slightly about 50m from the start, and it resembled a church ceiling made out of tree branches, curving over the pathway as if to protect those walking on it. As we stood gazing at the beautiful pathway ahead of us, we noticed large grooves in the cliffs to our right. It looked like a giant had drawn its fingers through the forest, leaving behind huge gaps in the hills and forest. We had read that there were World War I era trenches in the area, so immediately we took off to explore and see if these were actually those trenches. 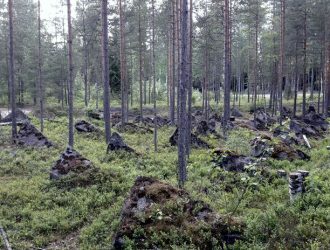 Because the Mustavuori area is a protected nature reserve, the trees that had fallen down into the trenches remained there… so that meant we were ducking under them and pushing over them as we made our way in the trenches. The very first trenches suddenly opened up and a huge cave stood in front of us. Its gaping black mouth seemed to continue forever, drawing in curious explorers and adventurers. Its walls were completely straight, so we suspected it could have been excavated to keep soldiers and weapons hidden. The cave continued at least 20m into the hillside and my flashlight wasn’t good enough so I left it in peace. My mom waved at me from further on, pointing at a narrow pathway leading to another cave. 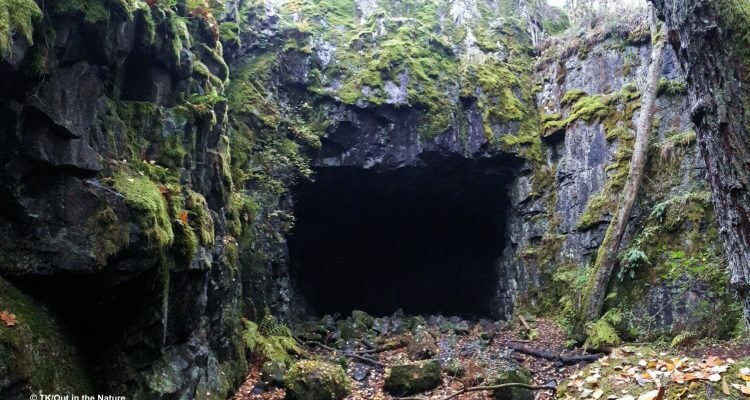 A similar huge hole had been cut into the hillside, but more interestingly, the narrow trench cut into the rockface continued up the hill and beyond the cave. It would have been very interesting to explore but mom took one look at it and said: Good luck, I’ll wait you on the other side. I was tempted to try it but realistically it wouldn’t have been a good idea because it was very slippery. We later found out that that path connects these caves to the other ones near the fortress. It doesn’t go underground but it becomes very narrow, only little over 1m (3ft), in width, so it resembles a proper gorge. We returned to the original path because we wanted to see more of the area. The footpath narrowed some more, turning and twisting near the trenches and quite close to the motorway next to the area. The beautiful woodland grove with rare-in-Finland hazelnut trees, buckthorn, and little-leaf linden opens up above the dark trenches; during the spring and summer times, these forests are full of birds chirping and cheering. The small path connected to a larger one leading up the hill. More trenches (and probably goblins and even some trolls!) hid behind dark green mossy hills, inviting to explore further. The forest turned darker the further we walked up the hill, leaving the leafy-green grove below us. Suddenly we faced enormous spruces that must have stood there for several centuries: they felt as if they were guarding the stone path that started only some metres after them. We arrived at a fork on the road but decided to follow the paved one because we knew it was getting darker and wanted to reach the fortress on time. Having reached, what seemed to be, the top of the hill, we looked around for any sights. Nothing. We descended slightly and stumbled onto some of the deepest trenches we had seen there, at least 2m tall. They snaked around next to the road but they were so full of fallen trees, leaves, and jagged rocks that it was safer to stay out of them and just follow them from above. We followed the closest ones to the road onto another fork in the road. The path to the left was paved and the one to the right went straight into proper forest, so we kept it safe and followed the path. After only a minute or two, we realised that we had actually reached the so-called fortress site of Mustavuori. The dark forest opened up to smooth rock surfaces which turned out to be anything but that. As soon as we got to the fortress area, we saw another enormous cave on our left side, and leading up to it was a trench cut into the rocks. We decided it was a little bit too late to go spelunking in the caves so we continued to explore the top of the cliffs. It was easy to see where a large antiaircraft gun had once been placed, so we looked around for more historical clues. Then, my mother yelled out only 2m from me and told me to walk carefully. Right next to her were some trees and then, a massive 15-20m drop into another cave structure. There were no warning signs, no tape or barriers in front of the cave, and it would have been easy to fall right in. We could see that it there was a path leading into the cave but decided to leave it unexplored as well due to the setting sun. 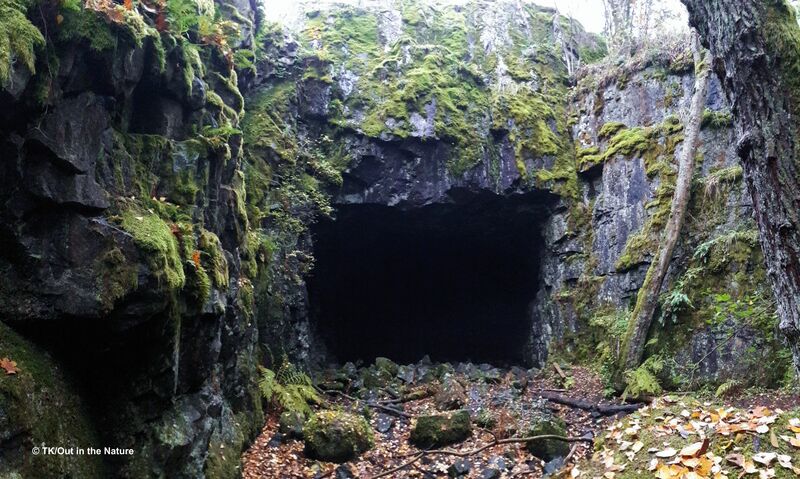 The two caves are linked and kept relatively dry so next time I will go spelunking. The road back towards our car was a gentle slope downhill. We spotted several markers for skiing opportunities in the area on our way down; not all of the paths in the area have street lights but they can all be used for cross-country skiing in the winter. All in all, what a great place: you get to see a lot of nature, history, and myths on a 1,5km (0,9mi) path that takes you about 1h to walk around. The Mustavuori area is a lush grove during the summers with hepaticas, wood anemones, and yellow anemones dotting the forest floor. The unique landscape attracts all types of rare birds to the area such as icterine warblers, blackcaps, and red-breasted flycatchers. On the southern tip of the area, an almost fjeld-like hill rises above the landscape. 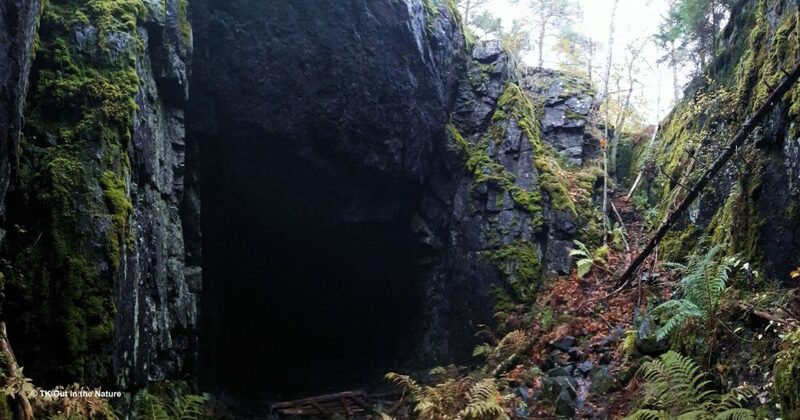 Due to its height as well as its close proximity to the Vuosaari port area, the Mustavuori area was selected by the Russians (Finland was a part of the Russian empire until 1917) as an excellent place for a fortress during the First World War. The stone-paved pathway was created during the early 20th century as well as the trenches but the building of the fortress itself wasn’t finished. Address: Type Mustavuoren linnoitusalueen parkkipaikka, 00970 Helsinki on your navigator. It will take you to the car park area nearest to the start of the path. Map of the path: You can choose whether to go along the smaller footpath (red) or to follow the official path (white). 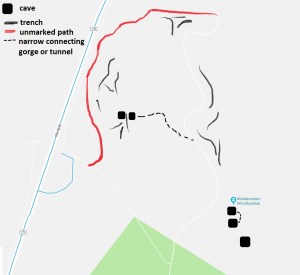 I have marked some trenches and caves on the map. 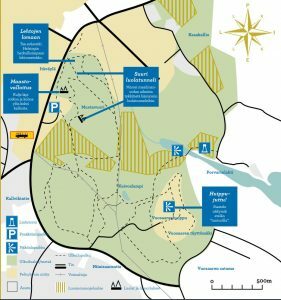 How to get there: You can get to Vuosaari and Mustavuori by car, by public transport or by bicycle. Car: Set Mustavuoren luonnonsuojelualue, Helsinki in your navigator. Just next to it is a small carpark where you can park your car. Bicycle: There are well-maintained gravel and asphalt roads for bicycles as well as excellent maps. There are tracks suitable for cyclist and pedestrians going through the forests and they are lit even during darker times. You can also cycle all the way to the trenches, the caves and the castle area even though there are some slightly tricky bits on the unnamed path. Public transport: Getting to Mustavuori from, for example Helsinki, is very easy and there are buses going several times an hour even during the worst of times. By public transport, the travel time is about 35mins including the walk to the start of the path. Check the timetable from the Capital Area Route Planner. The closest/best bus stops are called Fallbacka, Kallvikintie or Saanatunturintie. You will have to walk a few hundred meters from these bus stops to reach the exercise and nature path that goes around the Mustavuori area. Accessibility: The Mustavuori area has degrees of accessibility. If you stay on the official path, the path is very accessible even to wheelchairs and children’s buggies. You can even reach the fortress area with your buggies if you manage to navigate some well-worn tracks on the smooth cliffs. The stone path doesn’t go all around the area so if you want to do a circle and see the rest of the caves and trenches, then remember that the path becomes very small, basically a footpath that doesn’t support heavier wheeled vehicles. All in all, the area is, however, suitable for children as long as you keep a good eye on them and inform them that there are very deep trenches and extremely dangerous caves near the path. There are some rises and falls on the path but in general it is a moderate trail. When to go: You can visit the area at any time of the year but make sure you visit the area when there is enough light. The trenches and especially the caves are extremely dangerous if you cannot see them. If you visit during snowy or wintery seasons, make sure you are careful because a lot of the more tricky areas can be hidden by snow. You don’t want to fall and injure yourself (or worse). Also note that there are no lights on the unofficial path, but the official path does have lights. What to wear: Mosquito repellent in the summer. Hiking shoes are good but normal sneakers will suffice. You can also do cross-country skiing in the area as long as you are careful. Special to remember: The Mustavuori area is a nature reserve so you are not allowed to make a fire in the area, move or take anything with you (rocks etc. ), or walk outside the ready-tread paths. However, you can pick mushroom and berries you find in the forest. Pick up any rubbish if you see any on the trail. Also remember that all pets have to be on a leash at all times. 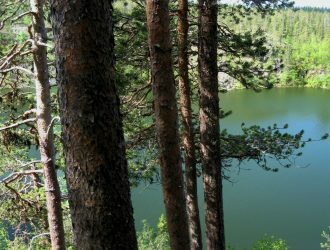 You can enjoy the larger Mustavuori area and Vuosaarenhuippu “mountain” peak that overlooks Eastern Helsinki.